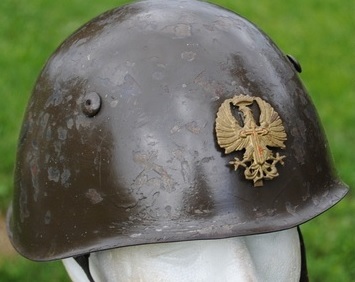 When Italy joined the Allied side in 1943, the M33 was obviously still the main helmet of the new Co-Belligerent Forces. In 1944-1945, the British attempted to replace the M33 with the Mk.II Tommy helmet; however only two divisions had switched by the time the war ended. Meanwhile the US Army transferred some M1 pot helmets as well, but not enough to completely re-equip any large units. After the end of the war in 1945, the Italian army gave some thought to abandoning the fascist-era M33 in favor of either the American M1 or British Mk.II Tommy. However the war in the Pacific was still going on, and the USA was unable to provide the required quantity of M1s. Meanwhile the Tommy was absolutely hated by Italian soldiers, and to a lesser extent, by the Italian public who saw it as a symbol of their army being reduced to second-rate status. After some thought it was decided to retain the M33 and the Tommy helmets were gradually phased out. 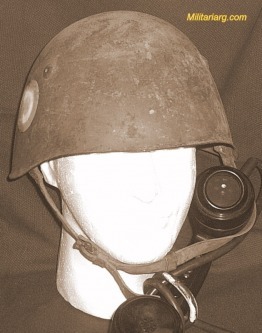 The M33 remained the standard Italian army helmet through the end of the 1980s. During the Cold War, production was restarted. Postwar-manufactured examples are nearly identical bit have a slightly different interior headband, a different serial number scheme, and have a canvas chinstrap replacing the leather one of the 1930s and 1940s. 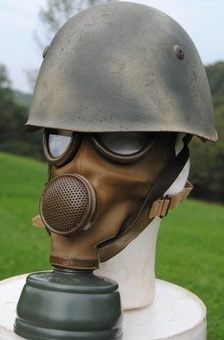 The old Italian army tradition of helmet plumes was retained and a device was issued so that these could continue to be fitted to M33s during the Cold War. The postwar Italian navy also retained the M33. It was used ashore for security details, commando units, and aboard warships for gun crews and bridge staff when the vessel was at battlestations. There was also a special naval version of the M33 with huge cut-out sections on either side, so that Italian sailors could use sound-powered phones found on American-supplied warships after WWII. The Italian navy retained the M33 until 1979. 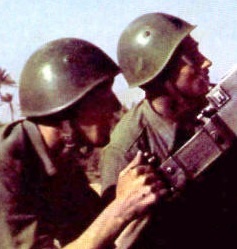 The Italian military published a user’s guide for the M33 in the 1950s. It laid out the proper wear and decorations, and warned Italian soldiers not to use the M33 as a cooking bowl, due to intense heat drawing out the steel’s temper and making the helmet likely to crack or shatter upon a severe impact. 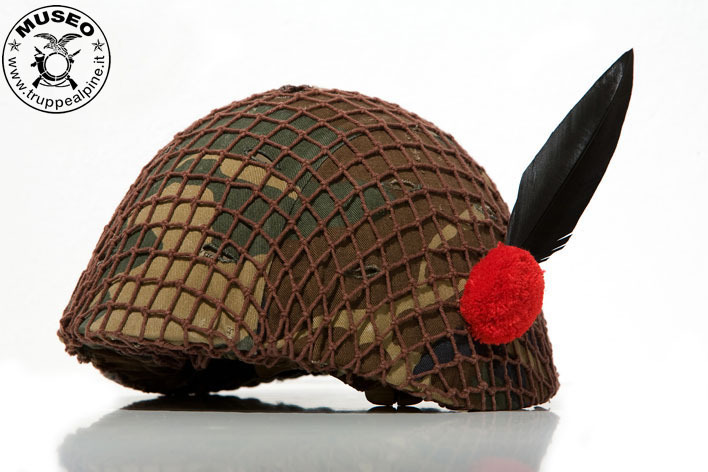 It should be noted that while the M1 pot helmet was in US Army service, it was often misused for the same purpose and the US Army issued a strong warning not to, for the same reason. 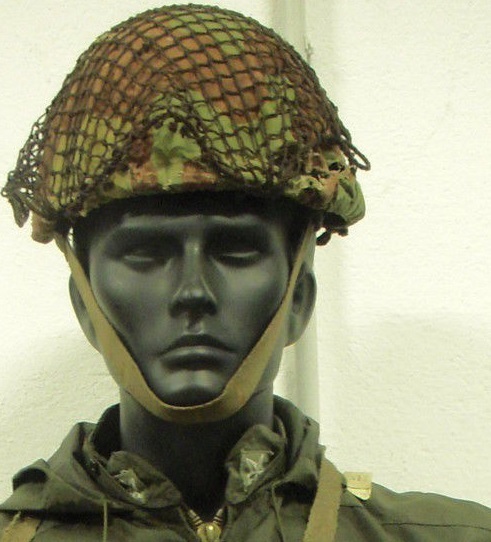 In the 1990s, Italy began phasing in kevlar helmets and the M33 was relegated to niche, specialty, or second-line units. The last user overall in Italy was the national forest service, which finally retired the M33 in 2014. Albania’s use of the M33 is most interesting, as the helmet had two separate “tours of duty” in the country. When Albania was an Italian vassal between 1939-1943, it’s small puppet army was partially equipped with M33s. 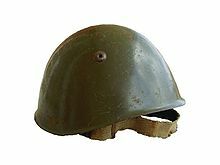 These continued in use when the communists took over in 1945, at the same time Soviet-made helmets began to replace them. 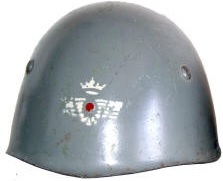 Some M33s were still in use at the start of the 1950s, and the helmet was officially relegated to reserve warehouses at the end of 1952. 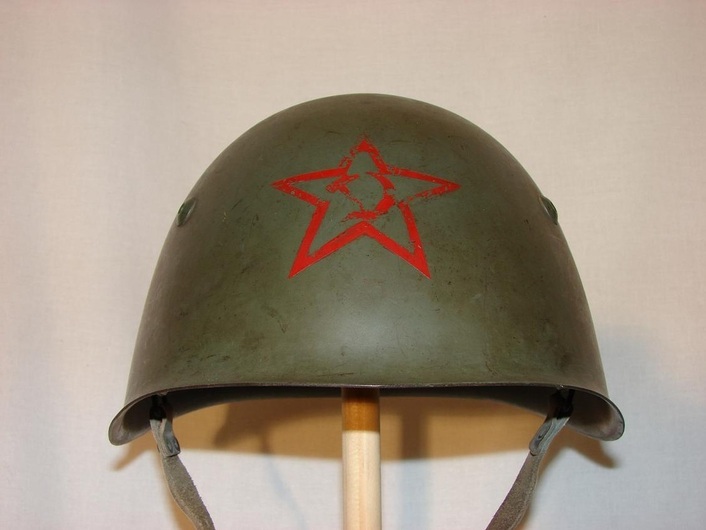 Later during the Cold War, Chinese-made helmets replaced the WWII-era Soviet ones, which in turn displaced the M33s from warehouses for scrapping. Communism collapsed in Albania in 1992. This was followed by a period of chaos, during which the already-backwards Albanian army fell into near complete disorder. 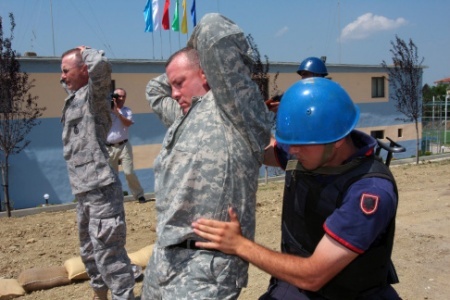 In 1997, Italy led a multinational force into the country to restore order and help rebuild the military to western form, as part of Albania’s goal of NATO membership (which it achieved in 2009). As part of the effort, a quantity of warehoused M33s were donated to the Albanian army. So once again, the M33 became Albania’s battle helmet, until it began to be phased out again after NATO military aid became available in the 2010s. 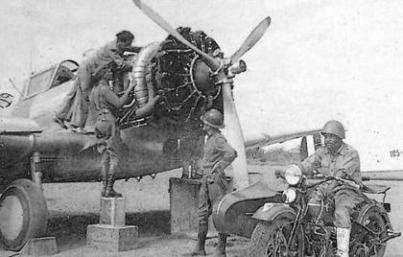 The Argentine army imported a small number of M33s during the late 1930s. They were not as popular as stahlhelms in Argentina, and only served a short while after WWII. Surprisingly, a handful of WWII-vinage M33s were found in use by the Bosniak muslim forces during the 1990s conflict there. These were almost certainly ex-Yugoslav (see below sections) and due to their small number, may have been museum loots. The army of Ecuador made a large buy of Italian helmets in 1938. Some were old surplus M15s (which the M33 replaced in Italian service) but more were new-production M33s. Ecuador fought a brief, one-month war against Peru in July 1941 (known as Guerra del 41 in both countries, and largely ignored elsewhere) which resulted in an Ecuadorian defeat. Ecuador’s forces were very poorly organized and many went into battle not having received their M33s, however, invading Peruvian troops captured a stockpile of them in an armory. 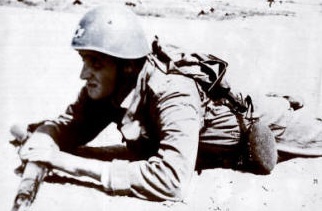 Because of the loss, and the now-possibility of friendly fire mistakes in any future war against Peru, the Ecuadorian army phased out the M33 in the early 1940s and replaced it with American-made M1 pot helmets obtained as WWII military aid. 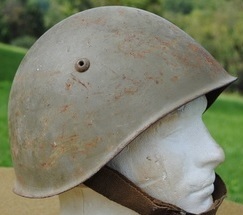 The Peruvian army imported M33s in the late 1930s, replacing WWI-era French helmets previously used. It’s M33 supply was then bolstered by examples captured from Ecuador in July 1941. Peru continued to use the M33 until 1956. Mussolini provided a quantity of M33s to Franco’s civil war troops, with deliveries starting in 1938. 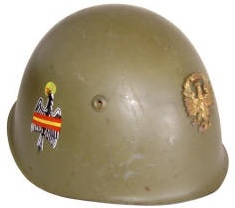 While the M33 was never the “main” Spanish helmet type, a significant number were imported and served on long after WWII ended. As Spain remained neutral in the war, none were lost. The Spanish air force also used the M33. Their examples were painted haze grey and had Spanish air force wings painted on the front instead of the Cruz Santiago badge. In the post-WWII era, the M33 was still fairly common in Spanish service into the late 1950s. During the 1960s it was progressively withdrawn from use. Few were camouflaged although units serving in Spanish Sahara sometimes repainted theirs desert beige. The M33 was withdrawn from large-scale Spanish use in the 1960s. By the early 1970s, only niche users in the Spanish military were still using it. By the time of Franco’s death in 1975, the only user was the Spanish Air Force Academy, which issued them to cadets until 1978. 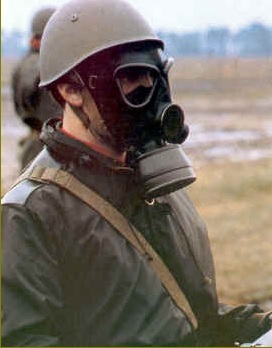 The JNA (Yugoslav Federal Army) used M33 helmets in the immediate post-WWII period, along with British, German, and Soviet helmets. These M33s were obtained from a number of sources. Some were captured during the war by partisans fighting Italian troops in what is today Kosovo and Macedonia, others were left behind when the Italians evacuated Dalmatia and Trieste at the end of the war. The Yugoslavs phased the M33 out in the early 1950s. Italy did use SMLEs, Bren Guns and Thompsons for some time after the war, however the longest serving weapons were the M1 Carbine (in the Carabinieri corps) the M1 Garand (domestically produced by Beretta also), the Beretta 34 pistol, the MAB 1938 submachine gun (into the 1970s), the Breda-SAFAT and, believe it or not, the Carcano rifle (until 1981). MG42s are still in use. 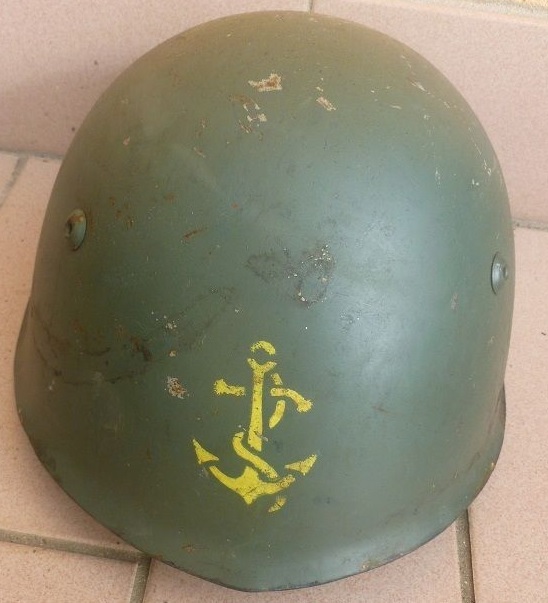 I used the M33 steel helmet during my Italian military service in 1997/98. 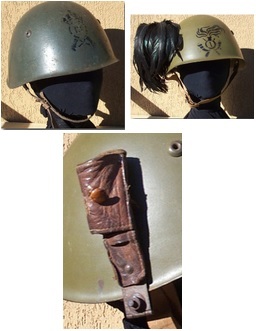 I was issued a post-war version with a canvas chinstrap, but there were still older versions with leather chinstraps, some probably WW2 refurbished helmets. Albania also used the M33 in the 1950s, the country had been annexed by Italy in 1939 and after 1943 Italian military equipment was taken over by the Albanian resistance fighters who formed the basis of the new post-war Albanian army. BTW Albania and Lebanon are still using the M33 since they acquired surplus stocks as Italy moved on to Kevlar helmets. I believe I saw mixed piles of M33 helmets in Asmara, Eritrea after the civil war ended (1994/95), but maybe they were Bulgarian. I definitely did see other surplus Italian gear, mixed in with other surplus gear that the Eritreans had thrown into large piles here and there.